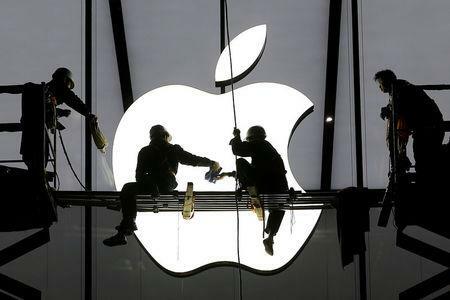 TAIPEI (Reuters) - Shares of Apple Inc suppliers fell across Asia on Monday after U.S. President Donald Trump tweeted that the tech giant should make products in the United States if it wanted to avoid tariffs on Chinese imports. Trump's comment came after Apple told U.S. trade officials on Friday that proposed tariffs by Washington in an escalating trade war with China would affect prices for a "wide range" of Apple items, including the Apple Watch. It did not mention the iPhone. Lens Technology Co Ltd, Universal Scientific Industrial Shanghai Co Ltd and Suzhou Anjie Technology Co Ltd fell between 6 and 8 percent. In Taiwan, camera lens-maker Largan Precision Co Ltd slid nearly 8 percent, Foxconn, formally known as Hon Hai Precision Industry Co, fell 3.4 percent, while assembler Pegatron Corp dropped nearly 4 percent. Taiwan's ASE Technology Holding Co Ltd, which counts Apple as one of its top clients, fell 2.9 percent. Chien Bor-yi, an analyst at Taipei-based Cathay Futures Consultant, said Apple's component supply chain in Taiwan would take a major hit if the United States increased tariffs on Chinese imported products. "People have concerns about the stock market. It's not a seller's market, but it's also not a buyer's market. No one knows how deep the well is," he said. Hong Kong-listed AAC Technologies fell more than 5 percent. The company supplies acoustic components and haptic technology - which enables users to receive tactile sensations from an interface - for Apple products such as the iPhone, iPad and Apple Watch. In Japan, Nissha eased 0.4 percent, Japan Display fell 0.7 percent and Sharp Corp dropped nearly 1 percent. "People are in a bit of a panic today. Looking forward, the focus would be on how the market reacts after Apple releases its latest models," said Kevin Chung, analyst at JihSun Securities Investment Consulting.